A new fundraising initiative at Dorset County Hospital will allow for clearer and quicker procedures for patients with pleural diseases. The initiative is being driven by the Friends of DCH, who have pledged to raise £17,000 for a new ultrasound machine for the Respiratory Department. A main benefit of the machine will be allowing the respiratory team to diagnose patients suffering from pleural effusion more efficiently. Pleural effusion is a build-up of fluid between the lung and the chest wall and causes breathlessness and chest pain and can be found in conditions including cancer, pneumonia, rheumatoid arthritis, heart or liver failure and kidney disease. The hospital’s pleural clinic already sees up to 250 patients a year. 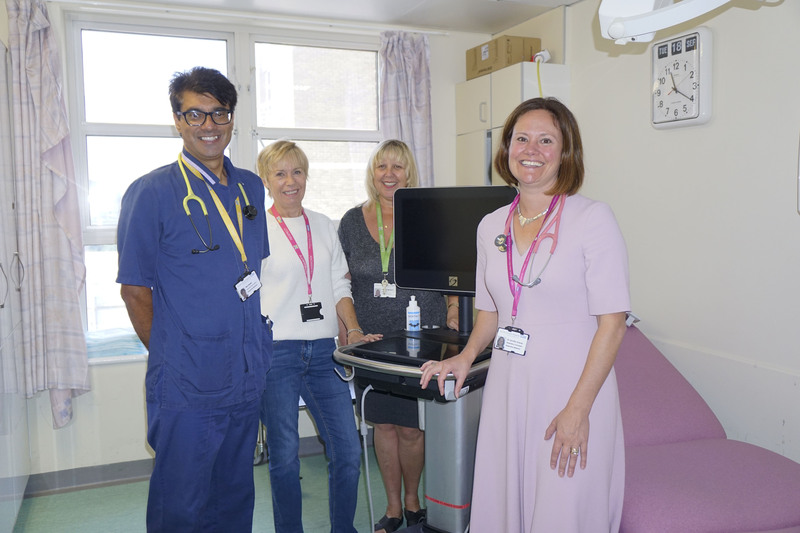 Having this equipment could benefit extra patients and reduce waiting times. Respiratory Consultant, Dr Jennifer Graves, said: “The department does have an ultrasound machine but it is about 10 years old now. The new one will allow for much clearer views and a quicker procedure time for the patient. “It will allow much clearer imaging of the patient’s lungs in order for a sample of the fluid to be taken and will improve our overall service. Dr Graves added: “The machine is essential for my service but it will also be used by the Acute Admissions Unit, who we work closely with. It can be used for a whole range of procedures – such as checking for fluid in the abdomen and fluid around the heart – so it will be multi-functional. Manager of Friends of DCH, Sharon Merrit, said: “We had previously been fundraising for the Cancer Appeal and it was time to focus on a new project. “We met with the Chairman and Trustees to decide what to do next. There is an awful lot done to support those with cancer and for children so it was decided to do something different and to put our fundraising efforts towards the Respiratory Department. “The new ultrasound machine will make such a difference to the department.